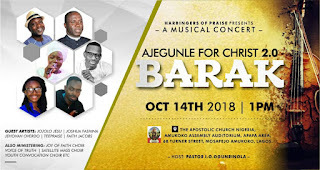 The second edition of Ajegunle for Christ, a program set to reach the metropolis of Ajegunle through evangelism and transformation of life through songs is here again. 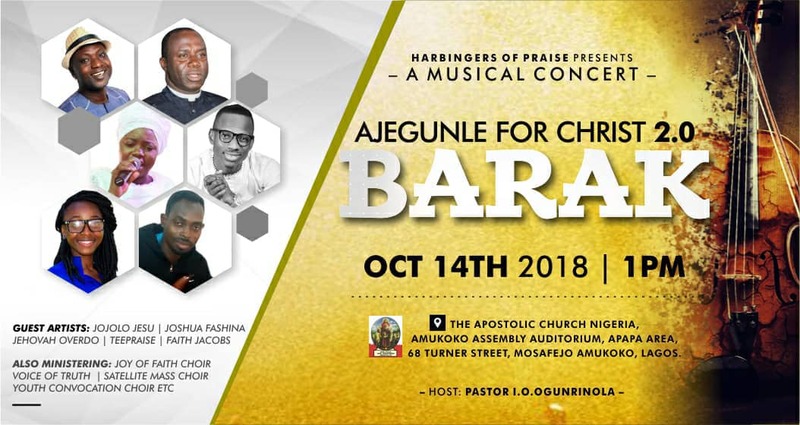 Tagged 'Barak' the concert will take place on the 14th of October, 2018, at The Apostolic Church, Amukoko Assembly, 68 Turner streets, Amukoko Mosafejo, Lagos by 1:00pm. At the concert, Rev. Solomon Utere (Jehovah Overdo), Jojolo Jesu, Agba Joshu, Tee Praise, Faith Jacob, Voice of Truth, Joy of Faith, Youth Convocation choir among many others will be on band stand to praise God with their gifts. To be hosted by Pastor I.O Ogunrinola, Apapa Area Superintendent, the event will shake the whole of Ajegunle. According to the organizers, "Ajegunle was chosen because it is known with its own peculiarities. "It is a city filled with all sorts of vices. Yet, it has pleased the lord to lay it in our hearts to reach out to these people through songs." "Music has been a part of human experience from the beginning. It is a gift from God, and a confirmation of His power and glory." "We sing because God sings. It is for this reason that we can begin to understand why music has such a powerful hold over us." "Disbelief today is not a function of logic; it stems from a loss of imagination." "If the visible church isn’t singing the song of Jesus, who else will? If we won’t allow music to unite us, we will show ourselves as a divided body to the outside world." "Christianity alone holds the keys to the kingdom, but we weren’t told to lock ourselves in the castle." "Our song is our witness- our proclamation that the father is still working, that Christ is still king, that the Spirit is alive and well, and that with God all things are possible." 1 Cor 9:22 says, “To the weak became I as weak, that I might gain the weak: I am made all things to all men, that I might by all means save some". About us: Harbingers of Praise was established to plan and execute life-changing programs which bring together people from all walks of life and bring them to their creator. We do this by organizing outreaches, retreats, crusades, concerts and through various publications. Our programs are spiritual, informative and educative and aims to reduce the high level of decadence in our immediate society.